Stampin' Up! Workshops: Get together with a group of your friends to learn how to make handmade cards, gifts and/or scrapbook with rubber stamps and earn FREE Stampin' Up! products at the same time! No time to get together for a workshop? No problem! We can do a catalog party and you can still get the benefits of hostessing the party. Contact me for more information about hostessing a workshop. Classes: I offer several different classes throughout the year that focus on techniques, specific products, card making, handmade gift items, paper crafts and scrapbooking. Contact me for more information about classes. Class dates will be posted on my blog. Clubs: I would love to set up a club for you and your friends. Clubs generally meet once a month (or whatever works best for the members) and members take turns "hostessing" so that they each receive the benefits. I offer the following clubs: Stamping Clubs, Card Making Clubs, Scrapbooking Clubs, and Technique Clubs. I can also customize a club to fit what the members want to do. Contact me for more information about starting a club of your own. Card Kits: Do you want to put together your own cards, but just don't want to purchase all the supplies needed? You can purchase card kits from me that include pre-cut and scored cardstock, pre-stamped images and the embellishments needed to create the cards. There is one finished sample of the card for you to follow. Contact me for more information about card kits. Finished Cards: Do you ever find yourself in need of a card for a special event or just to let someone know you're thinking about them? Maybe you have an upcoming occasion that you need invitations, announcements or thank you cards for? I can work with you to design a card that fits your needs, or you can purchase pre-designed cards from me. Contact me if you'd like to learn more. Specialty Items: Would you like to purchase items such as favors for showers, weddings or parties, home decor or gift items? I can make these items for you. Contact me if you'd like to learn more. Gift Certificates: I offer gift certificates that can be purchased in any dollar amount. These certificates can be used to purchase Stampin' Up! products, to pay the class fee of any class I offer, or to purchase card kits, finished cards or specialty items from me. This is a great gift idea! Contact me if you'd like to purchase a gift certificate. Wish List Management: I offer wish list management for customers. 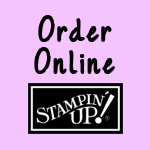 You can email me your Stampin' Up! product wish list and when your family or friends purchase items from your list from me, I will keep track of the items like a gift registry to prevent duplication. Convenient Ordering: You can place an order from me at a workshop, a class, by email or by phone at any time. I can even have the order sent directly to your house or place of business. You can earn hostess benefits on your orders if you host a workshop, have a catalog party or purchase enough product to qualify for hostess benefits on your own. Catalogs are available from me or you can view them on my blog or my Stampin' Up! website. Part-time or Full-time Business Opportunities: If you are thinking about becoming a Stampin' Up! demonstrator I would love to assist you in your endeavor. There are many different types of demonstrators. For a list click here. I am part of a wonderful group of demonstrators. They are all so talented and you would really benefit from being part of the same downline. Please contact me if you'd like to learn more.